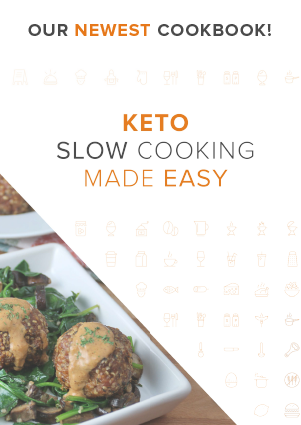 Some of you out there might be shaking your head at the idea of pork rinds, cereal, and cinnamon going together – but take a leap of faith with me. When these initially came out of the fridge, the absolute first thought that I had was “WOW, Salted Caramel Popcorn!” Seriously, these things are almost too good to be true. That said, if you’re not a fan of cereal, make these and eat them as snacks. They’d go great with a late night and a movie on the side! 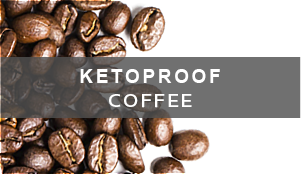 This is such a simple and easy recipe that you could make it in bulk for every morning to come. These store quite well in the fridge and stay crunchy for at least 3 days. Best part? They actually stay crunchy in the milk. Once the caramel has coated them, they won’t absorb as much milk as if you weren’t to put caramel on them! The type of pork rinds you get is pretty important. 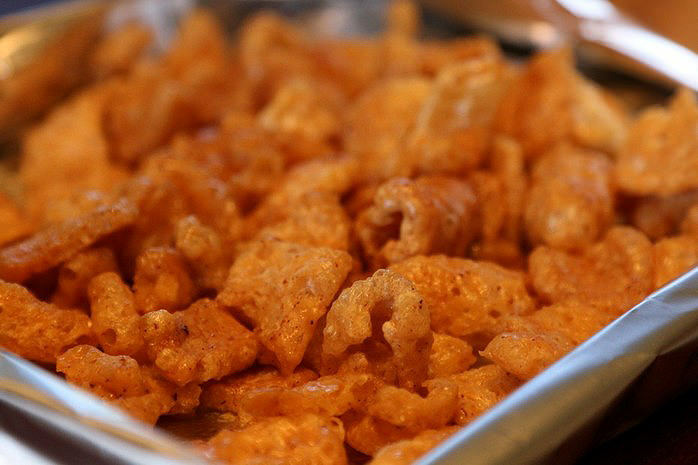 You don’t want to have to chip a tooth and visit the dentist after eating these – so make sure you get the type of pork rinds that are light and puffy; not the hardened, very crunchy ones. 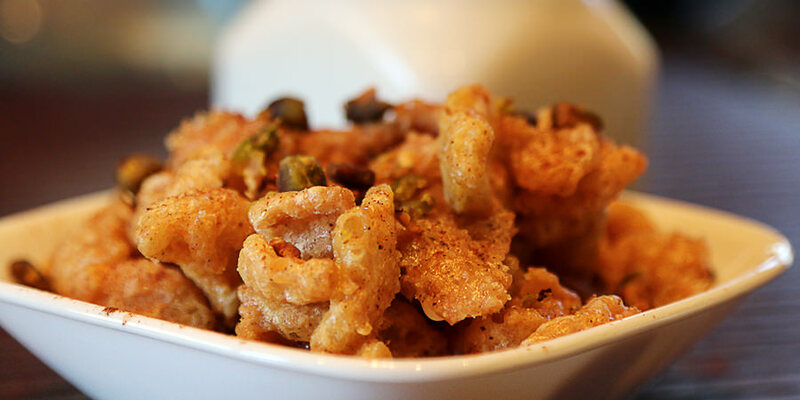 I am using Utz Pork Rinds which seem to give a great texture when doing this recipe. These do become a bit crunchier once the caramel hardens, so you don’t have to worry about that. 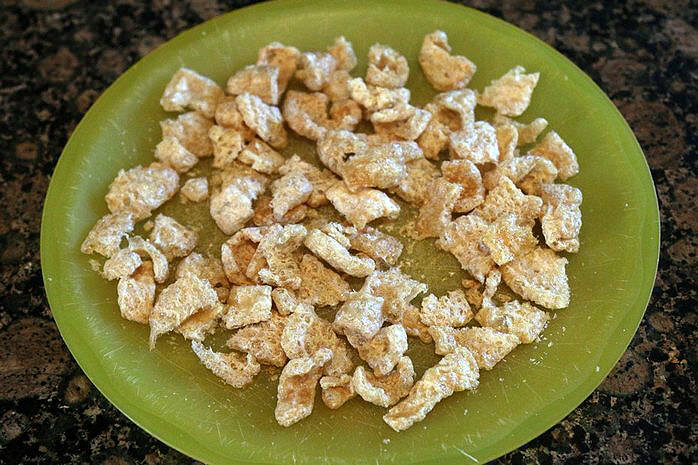 They turn out very similarly to cinnamon toast crunch with a bit of butter added to them. Enjoy, and as always I’d love to hear your input and feedback in the comments below! 1. Measure out 1 Oz. of pork rinds. I’m using Utz Pork Rinds. 2. 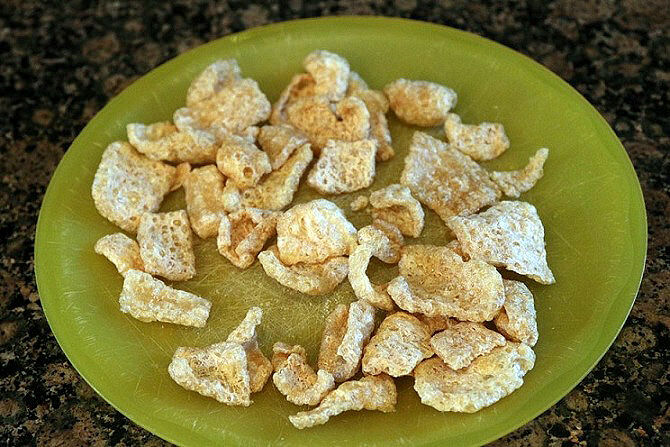 Break your pork rinds up into smaller pieces, resembling cereal bits a little bit more. 3. On medium heat, add 2 Tbsp. 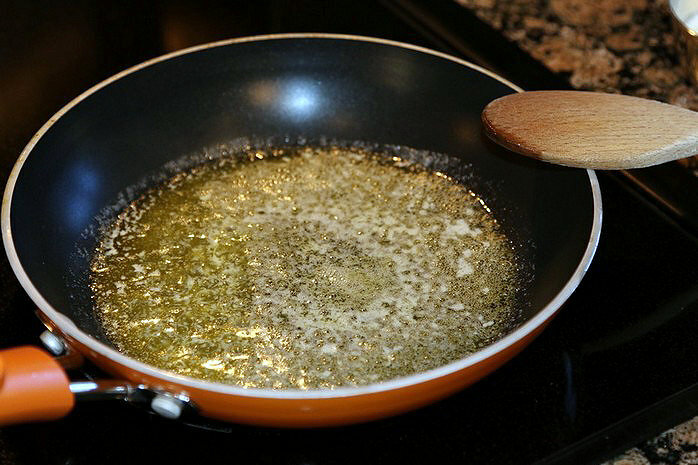 butter into a pan. In a ramekin, measure out 2 Tbsp. 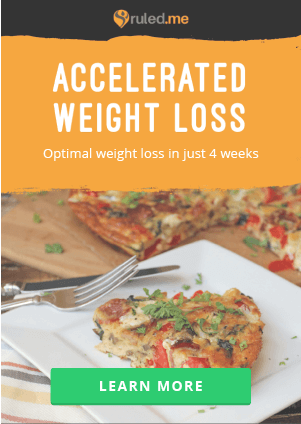 Heavy Cream and 1 Tbsp. NOW Foods Erythritol. Keep these on the side. 4. Continue to let the butter cook, it will start bubbling a little bit. You can stir it as you want. 5. You want your butter to cook a little bit and brown. This will not only bring a different flavor profile to the caramel, it will add the color. 6. 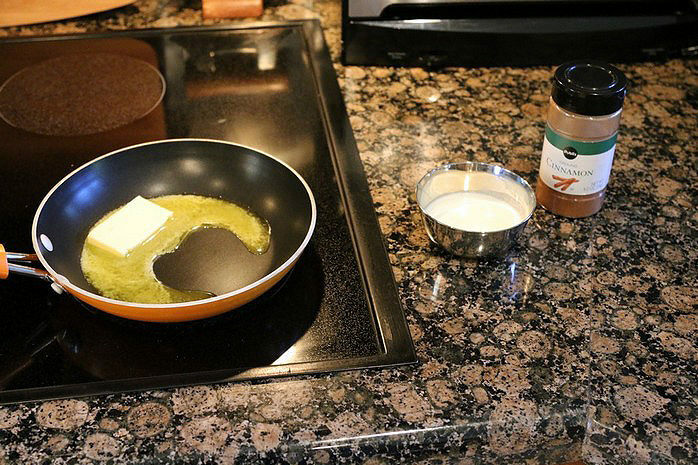 Once your butter is browned, remove the pan from the heat and add the Heavy Cream and NOW Foods Erythritol. Continuously stir this and return it to the heat. 7. Continue stirring until a caramel has formed. 8. 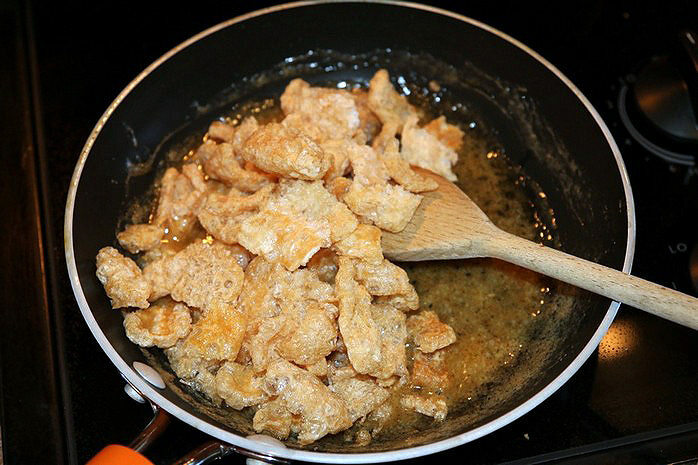 Once the caramel has formed and the mixture has cooked down a little bit, add your pork rinds. 9. Coat the pork rinds in the caramel sauce, making sure each pork rinds gets some caramel. 10. 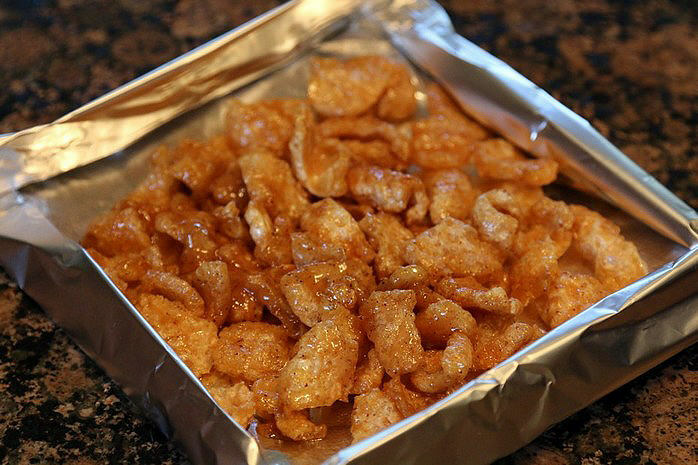 Transfer the caramel coated pork rinds onto a plate or foil. You can fold the edges up on the foil to that it creates a bowl. 11. 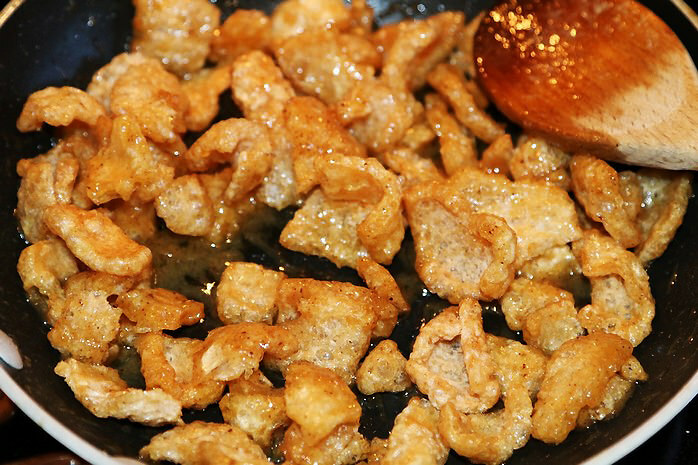 Put the pork rinds in the fridge for 20-40 minutes, so that the caramel can harden. 12. Remove the pork rinds from the fridge once the caramel has hardened. 13. 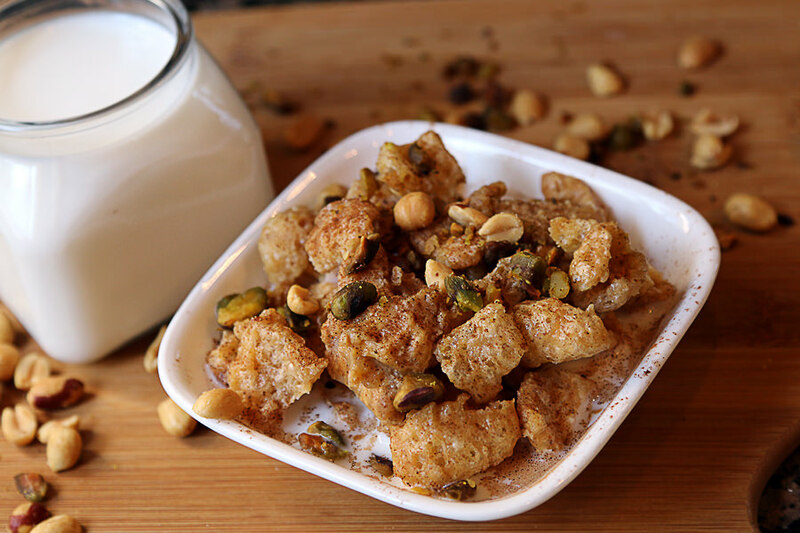 Pour your coconut, almond, or reduced carb milk over the pork rinds and enjoy! The milk I am using is a brand called Calorie Countdown (which has just over 2g Net Carbs per 1 Cup). 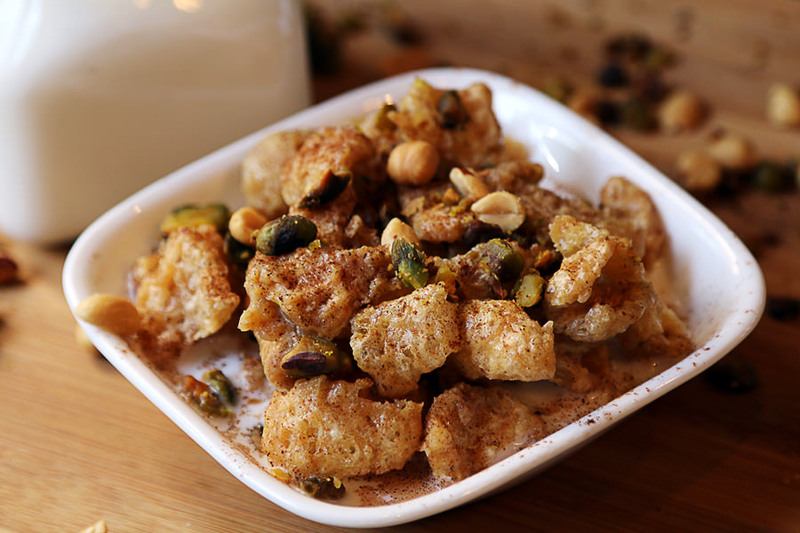 Garnish with a few nuts and cinnamon. You can easily make this into 2 servings, but I ate the whole thing for myself (yeah, yeah, I’m greedy). 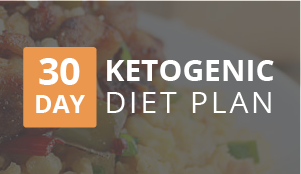 If you make this into 1 serving, it comes out to 514 Calories, 48.38g Fats, 2.05g Carbs, and 17.12g Protein. 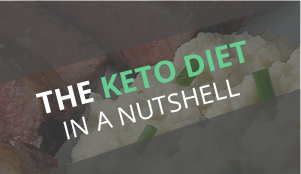 A fantastic start to the day for keto – a little protein, very few carbs, and a bucketload of fat. 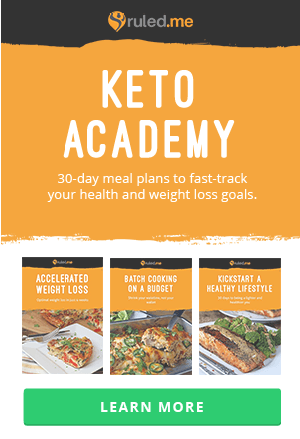 If you’re anything like me, these will keep you full way past lunch! 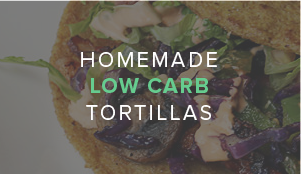 If you make this into 1 serving, it comes out to 514 Calories, 48.38g Fats, 2.05g Carbs, and 17.12g Protein. 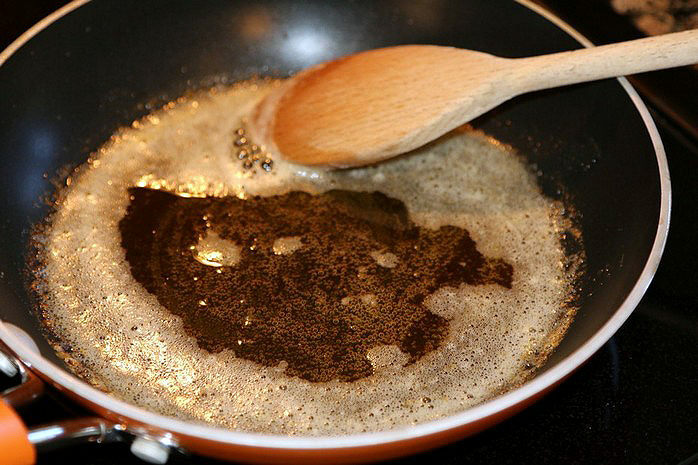 Put your pan on medium heat and add 2 Tbsp. Butter. Let this cook down until it becomes browned. 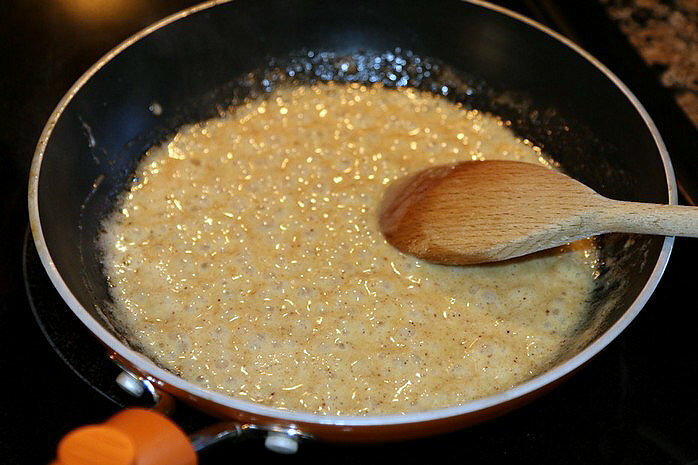 Remove from heat and add heavy cream and erythritol. Start mixing it and return to the heat. 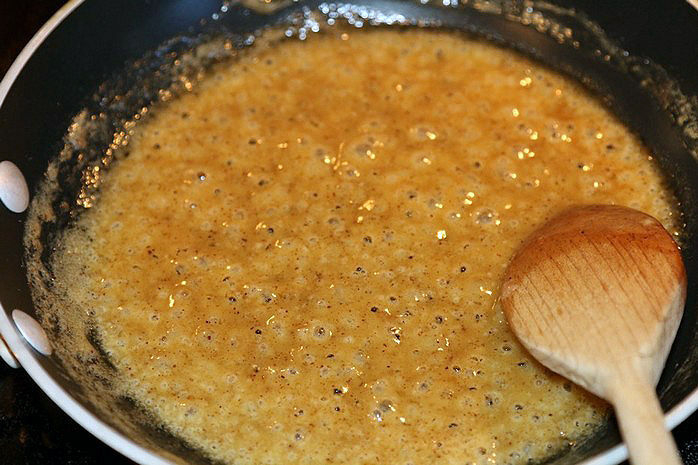 The caramel mixture will start bubbling. Continue mixing it until the color you want is attained. Once the caramel comes together, add your pork rinds and mix them in. Make sure all pork rinds get coated. 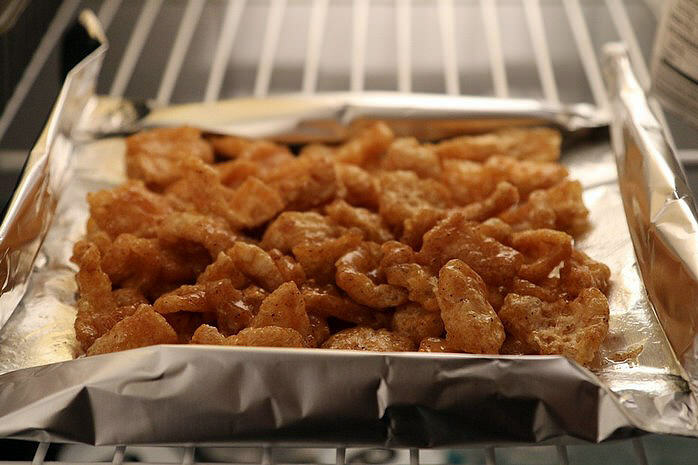 Transfer pork rinds to a container or onto foil and put in the fridge for 20-45 minutes. Serve with milk and garnish with nuts if you'd like.